Love your legs again with sclerotherapy. This effective treatment will vanish those unsightly varicose or spider veins. Make them a thing of the past! This procedure is very effective in removing varicose and spider veins. 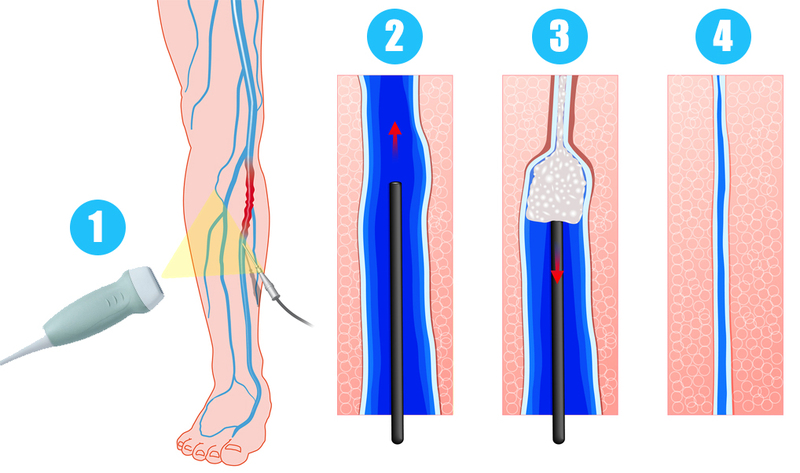 Sclerotherapy uses an injection of sclerosant (solution or foam) into a varicose or spider vein causing it to close. The difference between varicose and spider veins are size and appearance. Imagine your venous system as a tree, where varicose veins would be a major branch, and spider veins would be the leaves. With our vein clinic, we use an effective combination of ultrasound and foam to vanish varicose veins (as shown in the following diagram). 1. Varicose vein is located with ultrasound. 2. Catheter is inserted into the vein. 3. Foam infused causing the vein to contract. 4. Closed vein following treatment. Your legs will be wrapped in compression bandage or stockings, and usually can be removed and return to normal activities within 24-48 hours. Varicose veins in the legs usually result from weak or damaged valves in the veins. There is usually minimal or no discomfort at all during the treatment. Come And Visit Our Clinic to learn more about Sclerotherapy.